Body mechanics is a broad term used to denote an effort coordinated by the muscles, bones and nervous system. It can either be good or bad and can be directly related to the occurrence of back pains. Jobs of health care team members require pushing, pulling, carrying and lifting during patient care activities. Prolonged performance of these actions and utilization of incorrect muscles in completing a task can cause severe musculoskeletal strains and fatigue thereby increasing the risk of injuring the patients as well. To avoid these problems, proper body mechanics should be consciously used in performing a physical activity. Correct body mechanics is the utilization of proper body movement and a result of the coordination of musculoskeletal and nervous systems in maintaining balance, posture, body alignment during activity performance. The scope of body mechanics involves the knowledge on how certain muscles are utilized and explanations of its exploitation. 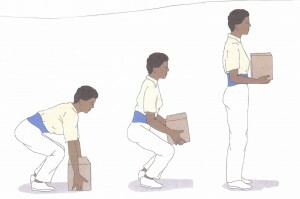 Maintain a stable center of gravity – This posture evenly distributes the weight in the body. A lower center of gravity means greater balance. Flex the hips and knees while keeping the trunk erect as an alternative of bending on the waist. A wide base of support is maintained – This provides lateral stability and helps in lowering the center of gravity. Wider base of support means greater stability. Spread the feet apart to a comfortable distance. Flex the knees to move the center of gravity to the base of support. Body alignment refers to the arrangement of joints, tendons, ligaments, and muscles while in a standing, sitting or lying positions. A line of gravity passing through its base for support maintains equilibrium. Equal activity balance in upper and lower body parts reduces risk of back injury. A stronger muscle group means a greater amount of work can be safely executed with it. Keep the back straight in performing any activity. Body balance is achieved when these principles are implemented. Always remember, when the body is improperly balanced, the center of gravity is displaced, the base of support is narrowed and the body is not correctly aligned. With hands placed on the object, flex elbows and lean into the object. Place the weight from the flexor to the extensor portions of the leg. Apply pressure using leg muscles. Alternate rest period is advisable to prevent fatigue. Hold object and flex elbows and lean away from the object. Shift weight from the extensor to the flexor portions of the leg. Assume a squat position facing the object or client. Grasp the object and tighten the abdominal muscles. Use the stronger leg muscles in lifting. In carrying, hold the object at waist height and near the body. Keep the upper trunk erect. It is easier to pull, roll, push, turn, lever and pivot that it is to lift something.